The upgraded Deluxe Active Jazz Bass was designed with the gigging bass player in mind. 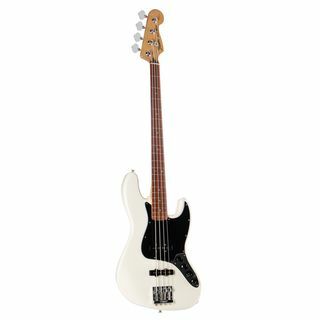 This bass offers players, classic styling and modern features such as a comfortable C-shape neck, active electronics and Vintage Noiseless pickups. Features: Alder Body Maple Neck, Modern C Shape, (Satin Polyurethane Finish) Rosewood Fingerboard, (9.5 Radius/241 mm) 20 Medium Jumbo Frets Scale Length: 34 (864 mm) Width at Nut: 1.50 (38mm) 2 Dual-Coil Ceramic Noiseless Jazz Bass Pickups with Nickel Plated Pole Pieces Controls: Master Volume, Pan Pot, 3-Band Active EQ with: Treble Boost/Cut: +/- 10 db @ 8kHz, a shift in the cut frequency, and about a 2dB slope per octave. Mid Boost/Cut: +10dB, -15dB @ 500Hz, and a wide band slope. Bass Boost/Cut: +/- 12 db @ 40 Hz, with a 4dB slope per octave. Pickup Switching: Pan Pot Standard Vintage Style Bridge Standard Machine Heads Chrome Hardware 4-Ply Brown Shell Pickguard Finish: Vintage White incl. Deluxe Gigbag !!! 3 years Music Store warranty !! !